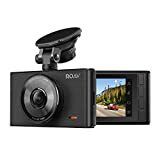 If you’re a trucker, it’s highly likely that you’re looking for a good dash cam to sustain your story in case you’re involved in an accident or witness something news-worthy. A good dash cam will be capable of recording every bit of evidence you’ll need to help insurance companies cover for any expenses accordingly. Nowadays, there’s a never-ending and ever-increasing number of reckless drivers plaguing highways and streets all over the country. Hence, finding an appropriate dash cam for your truck will help you ensure your safety and avoid any unnecessary expenses. However, be warned that not every car dash cam will work for every truck. Additionally, while we review the best truck dash cams, you may you want to learn how they operate. We’ll examine each device and its pros or cons. 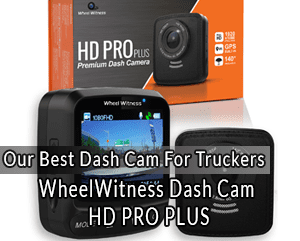 WheelWitness is one of the best dash cam companies on the US, and the HD PRO PLUS dash cam is arguably their best product. It comes with a free 16 GB SD card, too. Plus, its installation is very straightforward. It takes almost no time to set it up. Although its viewing angle isn’t as extensive as that of other cams, its incredibly high video resolution makes up for it. As a result, it can capture clear videos. It might only struggle recording license plates, but anything else should look incredibly sharp. Additionally, you can download an app which lets you control the camera using your phone, which comes incredibly handy when you’re on a long trip. Likewise, the camera is small and very easy to carry around if needed; it also takes almost no space from your field of view. This dash cam is one of those less-expensive WheelWitness products. Most of their products are made with cutting edge technology. You can look at this cam as a budget version of the HD PRO PLUS. 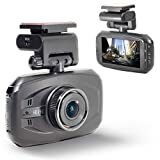 It is capable of recording very high-quality video and can show even the smallest of details that a trucker might need to sustain their story after a crash. Its lens is incredibly broad and covers a vast range, too: It’s ideal for large trucks. Additionally, images are captured even when the cam is recording at places with little to no light. Notably, it can loop-record as well. This feature allows the camera to automatically delete older recordings whenever the storage unit is full. Hence, it’s an important feature for those who tend to make long journeys and can’t afford to waste time sorting out their dash cam’s footage. 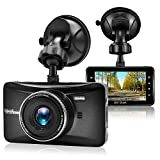 This relatively cheap dash cam has a built-in night vision technology, which permits the camera to capture high-quality videos even in dark environments. It is capable of recording traffic in very wide streets thanks to its huge lens, and it also offers 1080p video resolution. Sadly, this product doesn’t have an SD card included. Plus, it requires you to get one if the product is to function correctly. Regardless, it does offer support for cards of up to 128GB of storage. Moreover, it offers great visual and voice prompts, which allow owners to quickly make sure everything is okay. Additionally, its parking mode is also great. The Old Shark Dash Cam is a great product which has good video-capturing capabilities. Its LED light-source is topnotch; however, the cam doesn’t include infrared technology as advertised. On the other hand, durability is one of its most essential features. It can withstand long hours of constant use without showing any signs of breaking down. Thus, you can comfortably drive with it turned on for over 12 hours a day with no problem. Additionally, its package also includes a 32GB SD card, which is a huge plus for buyers who’d like to avoid shopping for an additional storage unit. The surface is well presented and the product itself looks well built, too. This mini dash cam is capable of recording video in 1080p, making it one of the smallest but most effective dash cams on the market. However, its angle isn’t as wide as that of other products in our list. On the other hand, it still supports recordings at up to 120°. Moreover, it also comes with a handy sensor that locks recording after any crashes ensue. This scenario means that the section of the video which contains everything related to the accident will not be removed unless the owner of the cam chooses to do so themselves. Another downside is that this product doesn’t include a memory card, but its size allows an SD card with up to 32GB of storage space. Additionally, the camera can be positioned without any problems on most windshields. There are some important features that you should look for in a dash cam. To start things off, you’ll need to make sure that the camera is suitable for trucks – as we’ve said before, not every car dash cam will be useful when placed in a truck’s windshield. Furthermore, a well-made camera should be able to last for a long time without losing video quality or the overall sturdiness of its build. Additionally, we’ve listed more features to take note of. Looping allows the dash cam to delete old footage to free up space. It permits the camera to operate continuously for as long as it stays charged without having to worry about deleting footage manually. It’s important for this feature to be accompanied by good g-force sensors, as these usually make crashes stay “locked” in the footage and not be taken away from the cam’s memory. A g-force sensor is a feature which detects whenever the truck is involved in a crash to trigger specific mechanism inside the dashboard camera. 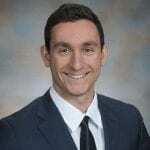 In most cases, it makes the recorded footage stay locked, disallowing automatic deletion without the trucker’s permission. 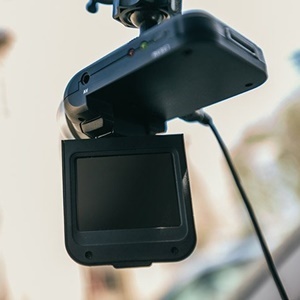 Even when the camera is off, motion sensors might allow the dash cam to turn itself on and start recording in case some incident presents itself while it isn’t active. 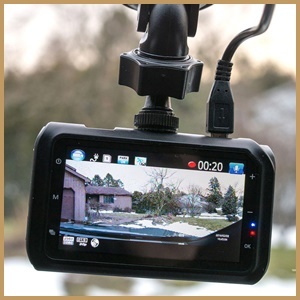 This attribute doesn’t only permit the camera to detect a potential crash, but it can also save the owner from a burglar looking to break into the vehicle. If you often embark yourself on long trips, you’re likely to find yourself on the road at nighttime. The night is usually a typical time for reckless drivers, so night vision recording might save you a lot of expenses. All the dash cams that we’ve reviewed today offer HD recording. You might find cheaper cameras with lower quality resolution, but the money you save in the dash cam might come back to haunt you later. The reliability of a dashboard camera is determined by how good its build is. If the cam is sturdy and well crafted, it should be able to last for a long time. Having to replace these dash cams often is an annoyance. Additionally, if it breaks down when you need it the most, you would regret your decision if you bought a lower quality product. These products are often used in the truck’s front windshield, so their size needs to be small enough to not bother the driver by interfering with their view. On the contrary, if you intend to use your camera on your rear windshield, size isn’t too much of an issue. Q: Where can I buy dash cams? You can visit local stores, but we recommend buying online to save you time and energy when you already know which would be the best dashboard camera for your truck. For a start, you can scroll up and visit our recommended products by clicking on the links. Q: How many dash cams does a trucker need? You can simply buy one for the front of your truck, but we recommend two cams: one in front and one on your truck’s rear. This is to ensure that you will be protected and with evidence on both sides of your truck in case something happens. Q: What is the best dash cam for truckers? Really, the answer to that would ultimately depend on you, the user and the driver. Additionally, your truck would be a huge determinant, too. You can use our guide to figure out the best dashboard camera after you’ve taken notes of the factors we’ve mentioned. 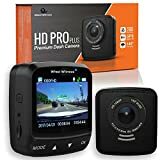 Spending a decent amount of money to purchase one of the high-quality dash cams we’ve shown you today will save you dollars in insurance costs in the future. WheelWitness stands out as the best brand, but Anker, like a few other manufacturers on our list, also competes for the title. Hence, pick one according to what truck you have and what lifestyle you follow. Now, which of these are you going to buy? 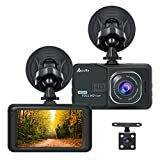 Are you considering purchasing two dash cams? Let us know your opinions below!